Here are this week's "Things I Am Loving This Week"-- a few mostly food-related things that I am enjoying right now and want to share. When the weather is warmer I like low-effort dishes that are light and healthy, but with big flavor and my Grilled Fish Tacos are a frequent go-to meal that I love. They are quick and simple and make the most of local island fish (in this case it is Opah--or moonfish), along with veggies from the farmer's market and my CSA box. I just slice my fish into pieces and cook it in a just a bit of olive oil and a spice mix of coriander, cumin, black pepper and a little cayenne pepper and a bit of salt, then I place it in warmed whole wheat tortillas with whatever veggies I have on hand. (For these it was just Chinese cabbage, red bell pepper and cilantro--all local). To top it off, a healthy sauce made with non-fat Greek yogurt, cilantro, lime and a pinch of cayenne, blended in my mini processor. Really good and really good for you! I bought some Bubble and Bee Organic products to give as holiday gifts last year and following my "one for you, one for me" shopping guidelines, ;-) I had to get some for myself. I just re-ordered to replace my last Sunflower Lotion Bar. I LOVE this product! It is 100% organic and is made with organic beeswax, organic cocoa butter, organic sunflower oil, organic lemon essential oil. It has the lightest hint of lemon scent to it, the texture just melts into your skin and it comes in a fun sunflower shape in a little metal tin. The company is based out of Utah and has some other great products too. Their little lotion sticks are perfect to travel with, (I love the coconut and lime one). No, they aren't food but they are made with natural ingredients and smell good enough to eat! 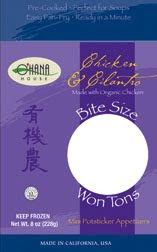 Whole Foods had the cutest little Bite Sized Won Ton from Ohana House that I had to try. They come in seven different flavors, including two vegan versions but I wanted to try the Chicken and Cilantro flavor. The mini won ton are made with organic chicken and natural ingredients and are the perfect size for putting in soups, which is what I did, making a hearty Asian Chicken Won Ton Soup to use up all the veggies in my fridge. The little dumplings have good flavor and were the perfect addition to the soup, just requiring a minute or two at the end of the cooking time to warm them up. These are the things I am loving this week...how about you? I love those fish tacos! So easy and filled with great flavor. I need to put that "one for you, one for me" rule into practice. Maybe I can buy my mom an ice cream maker...and then myself one as well! Good with with the storm. I love the sunflower in a jar - so cute. I'm also intrigued by how collected people who live in hurricane regions really are about impending storms - I would freak. As of right now, I'm adopting the one for you, one for me rule - I usually get something for Psychgrad and not for me and then am sorry I didn't get one for me. What I wouldn't give to be sitting in Hawaii...enjoying these goodies! Tropical storm...better than hurricane, I'd imagine...from far away, it almost sounds romantic. But I hope it leaves you safe! Your fish tacos look really good. I will have to keep my eye out for those mini wontons too - how cute. Hope you are safe from the storm. I am loving just about all of the things that you are loving! The fish tacos in particular are calling my name. I wish I could make them with local Hawaiian fish and vegetables, but I will have to make do with what I can find around here. The sauce with greek yogurt sounds particularly great! Mmm, great looking fish tacos! I remember Mario carrying around an Opah on Iron Chef, what a fish! I am all for the "one for you and one for me principal", especially with such wonderful goodies. What wonderful items. I especially love the Sunflower Lotion Bar. youre really making me wish I could eat fish. The tacos look great! so just give me double servings of the soup and I'll be a happy camper. Right now I'd love a little rain here :) but I'll just love the mildish summer day we're having right now. I love those little won ton. Can't wait until my next trip to Longboat Key. We have a Whole Foods there; none in my neck of the woods in upstate NY. Well, I think I love everything you love! I love fish tacos and yours look so simple. There is something about the addition of the cabbage that just makes them so great to me. At one restaurant I had them with a Thai chili sauce on top - fabulous! Stay safe in that storm. I hope it isn't too bad for you all. I adore fish tacos! These look amazing! Those fish tacos look wonderful! Another great recipe (and simple) that may actually get me cooking fish! I grew up in Florida on the coast and hurricanes always make me nervous! Fingers crossed! I love fish tacos! And the sunflower is so cute! Hope everything's ok with you and the storm. This is an interesting meal. I still have not had a fish taco and I have gluten free tacos. If mine looks as good as yours, it would be worth it.